IBM Storwize V3700 Storage System for Lenovo (Machine Type 6099) is a member of the IBM Storwize family of disk systems. 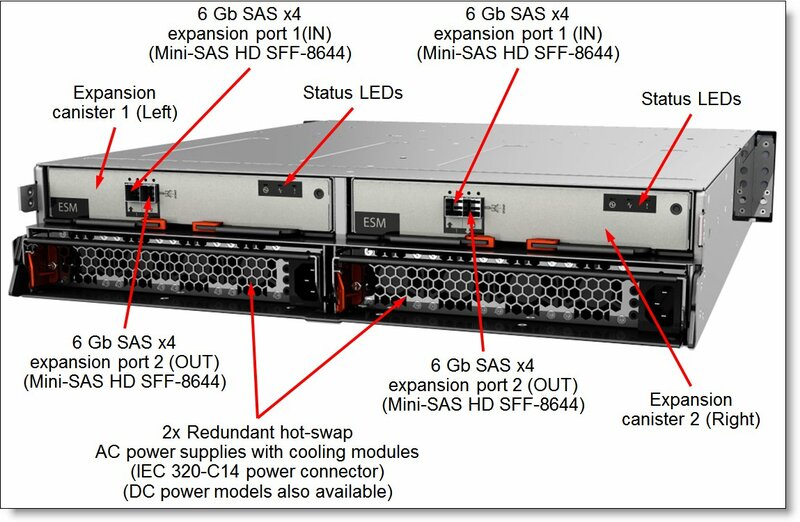 By using IBM Storwize V7000 Storage System and IBM SAN Volume Controller functions, interoperability, and management tools, Storwize V3700 delivers innovation and new levels of storage efficiency with ease of use in an entry-level disk system to enable organizations to overcome their storage challenges. Storwize V3700 Storage System features two node canisters, with 4 GB cache per canister upgradeable to 8 GB, in a compact, 2U, 19-inch rack mount enclosure. A 6 Gb SAS and 1 Gb iSCSI connectivity is standard, with an option for 8 Gb Fibre Channel (FC) or 10 iSCSI or Fibre Channel over Ethernet (FCoE) connectivity. Storwize V3700 supports up to 240 drives with up to nine external expansion units. It also offers flexible drive configurations with the choice of 2.5-inch and 3.5-inch drive form factors, 10 K or 15 K rpm SAS and 7.2 K rpm NL SAS hard disk drives (HDDs), and SAS solid-state drives (SSDs). Product availability: Storwize V3700 Controller Units are withdrawn and no longer available for ordering. The replacement product is Lenovo Storage V3700 v2. The Storwize V3700 SFF enclosure is shown in the following figure. Storwize V3700 provides small and midsized organizations with the ability to consolidate and share data at an affordable price, while utilizing advanced software capabilities that often are found in more expensive systems. Storwize V3700 can be scaled up to 960 TB of raw storage capacity. Storwize V3700 offers hybrid block storage connectivity with support for 6 Gb SAS, 1 Gb iSCSI, and 10 Gb iSCSI or FCoE or 8 Gb FC at the same time. Scalable, modular storage with dual-active intelligent array node canisters with up to 8 GB cache per canister. Flexible host connectivity to match diverse client needs with support for 6 Gb SAS and 1 Gb iSCSI connectivity standard, with optional 10 Gb iSCSI or FCoE, 8 Gb FC, or extra 6 Gb SAS or 1 Gb iSCSI connectivity. 6 Gb SAS drive-side connectivity with support for 12x 3.5-inch large form factor (LFF) or 24x 2.5-inch small form factor (SFF) drives in the controller unit; scalable up to 120 LFF drives per system with the attachment of LFF expansion units (12x LFF drives each) or up to 240 SFF drives per system with the attachment of SFF expansion unit (24x SFF drives each) to satisfy growing needs for storage capacity and performance. Flexibility in storing data on high-performance SAS SSDs, performance-optimized enterprise SAS HDDs, or capacity-optimized enterprise NL SAS HDDs; mixing and matching drive types and form factors within a single system to perfectly meet performance and capacity requirements for various workloads. Rich set of standard functions are available at no extra cost, including virtualized internal storage, snapshots, thin provisioning, data migration, and data replication. Optional licensed functions, including higher number of snapshots for added scalability, Turbo performance, Easy Tier, and remote mirroring. VMware vSphere Virtual Volumes (VVol) integration brings advanced storage management functions to the virtual machine level for finer VM storage service level control and policy-driven automation. Note: VVol integration feature requires IBM Spectrum Control Base Edition for Lenovo that can be downloaded from http://www.ibm.com/support/fixcentral. Intuitive, web-based GUI for easy system set up and management. Extensive interoperability with support for most major server platforms and operating systems. The Storwize V3700 LFF enclosure is shown in the following figure. The Storwize V3700 supports the complete range of data storage requirements, from highly utilized applications to high-capacity, low usage applications, with the flexible choice of drives. All drives are dual-port and hot-swappable. Drives of the same form factor can be intermixed within the appropriate enclosure, which provides the flexibility to address performance and capacity needs within a single enclosure. Up to nine Storwize V3700 expansion units are supported by a single Storwize V3700 controller unit. You can intermix 3.5-inch and 2.5-inch expansion units behind a 3.5-inch or 2.5-inch controller unit. This configuration delivers the added flexibility to mix 3.5-inch and 2.5-inch drives within a single system. More drives and expansion units are designed to be dynamically added with virtually no downtime, which helps to quickly and seamlessly respond to ever-growing capacity demands. The following figure shows the front of the Storwize V3700 SFF enclosure. The following figure shows the front of the Storwize V3700 LFF enclosure. The following figure shows the rear of the Storwize V3700 Controller Unit. The following figure shows the rear of the Storwize V3700 Expansion Unit. The following table lists the Storwize V3700 storage system specifications. Controller unit configuration Dual controller (known as node canister) configuration. RAID levels RAID 0, 1, 5, 6, and 10; Distributed RAID 5 and 6 (Distributed RAID is supported with the Spectrum Virtualize Software for V3700 version 7.6 onwards, which requires 4 GB to 8 GB cache upgrades). Controller cache 8 GB per system (4 GB per node canister) upgradeable to 16 GB (8 GB per node canister). Battery-backed cache protection. Intermix of SFF and LFF units is supported. Drive technology SAS and NL SAS HDDs and SAS SSDs. Intermix of HDDs and SSDs is supported. Dual-ported 6 Gb SAS drive attachment infrastructure. Host operating systems Microsoft Windows Server 2008 R2, 2012 and 2012 R2; Red Hat Enterprise Linux (RHEL) 5, 6, and 7; SUSE Linux Enterprise Server (SLES) 10, 11, and 12; VMware vSphere 5.0, 5.1, 5.5, and 6.0. Standard software features Virtualization of internal storage, Thin Provisioning, One-way Data Migration, FlashCopy snapshots (up to 64 targets). Optional features Turbo Performance, Easy Tier, Remote Mirroring, FlashCopy snapshots (up to 2,040 targets). Cooling Redundant cooling with the fan modules that are built into power supplies. Power supply Two redundant hot-swap 735 W AC or 800 W DC power supplies. Hot-swap parts Node canisters, expansion canisters, SFP/SFP+ transceivers, drives, power supplies with fans. Management interfaces 2x 1 GbE ports (UTP, RJ-45) in a primary/redundant configuration. Web-based GUI; SSH CLI; SMI-S; SNMP and email notifications. Warranty Three-year customer-replaceable unit and onsite warranty with 9x5 next business day terms. Optional warranty service upgrades are available through Lenovo: 24x7 coverage, 2-hour or 4-hour response time, 1-year or 2-year warranty extensions, Hard Drive Retention. * Performance measurements with the maximum number of 15K rpm HDDs supported by the system. The following table lists the models of the Storwize V3700 controller units. The Storwize V3700 controller units ship with two node canisters. A node canister provides interfaces for host connectivity, management, and internal drives, and it runs storage management and virtualization software. Each Storwize V3700 controller unit ships with 8 GB of battery-backed cache (4 GB per node canister) that can be upgraded to 16 GB (8 GB per node canister). The following table lists cache upgrade option. * One per node canister; both node canisters must have the same cache size. Note: Both node canisters must have the same type of the host interface card installed, and both cards must have SFP/SFP+ modules of the same type, if any. The following table lists the available host port configurations for the Storwize V3700 controller units. The following table lists ordering information for the host connectivity options for the Storwize V3700 controller units. * Up to one per node canister; both node canisters must have the same connectivity type. ** Up to one extra SW SFP module pair per 8 Gb FC host interface card in the node canister; both node canisters must have the same connectivity type. *** Up to two LW SFP module pairs per 8 Gb FC host interface card in the node canister; both node canisters must have the same connectivity type. The second pair of LW SFP modules replaces the SW SFP modules that ship standard with the 8 Gb FC HIC. 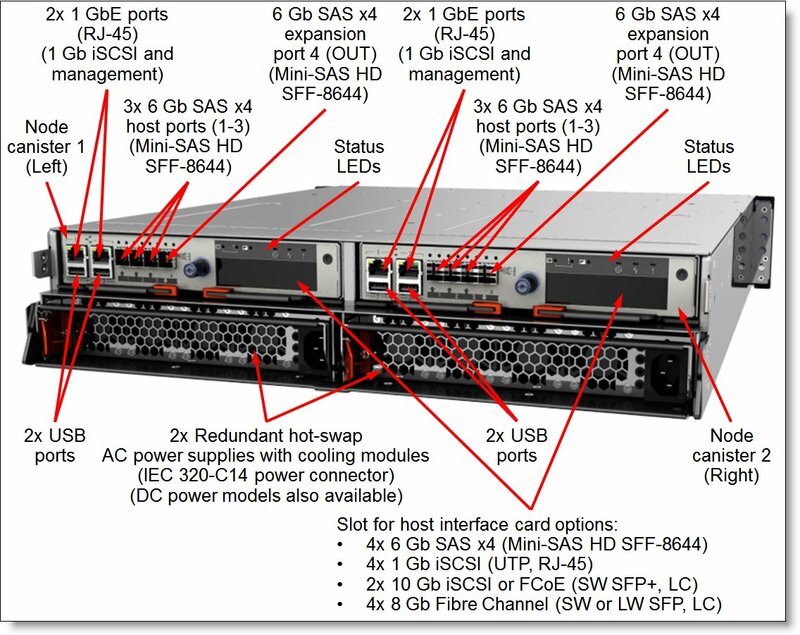 The Storwize V3700 controller units provide 6 Gb SAS internal dual-port drive connectivity, and each controller unit also has two 6 Gb SAS x4 (Mini-SAS HD SFF-8644) ports (1 port per node canister) for 6 Gb SAS expansion unit connectivity. The Storwize V3700 controller unit supports attachment of up to nine Storwize V3700 expansion units. Intermix of LFF and SFF units is supported. The enclosures can be added to the system non-disruptively. The following table lists the models of the Storwize V3700 expansion units. Each Storwize V3700 expansion unit ships with two expansion canisters. Each expansion canister provides 6 Gb SAS connectivity to the internal drives and two external 6 Gb SAS x4 ports (Mini-SAS HD SFF-8644 connectors labelled Port 1 and Port 2) that are used for connections to the Storwize V3700 node canisters and for daisy chaining the expansion units between each other. The expansion port (Port 4) on the Storwize V3700 node canister is connected to the Port 1 on the expansion canister. The Port 2 on the expansion canister is connected to the Port 1 on the expansion canister in the adjacent enclosure, and so on. The expansion unit connectivity topology is shown in the following figure. The following table lists ordering information for the expansion unit connectivity options. * One cable per expansion canister; two cables are required per each expansion unit. The Storwize V3700 LFF controller and expansion units support up to 12 LFF hot-swap drives, and the Storwize V3700 SFF units support up to 24 SFF hot-swap drives. The following table lists drive options for the Storwize V3700 LFF units. The following table lists drive options for the Storwize V3700 SFF units. Note: Storwize V3700 functional capabilities that are described in this product guide are based on the Spectrum Virtualize Family Software for Storwize V3700 version 7.8. The Spectrum Virtualize Software for Storwize V3700 version 7.8 requires 8 GB cache memory per node canister. Provides the flexibility to choose the level of data protection that is required. Helps improve performance and availability with significantly faster rebuild time by allowing data to be distributed across more physical drives that are used simultaneously. Enables rapid, flexible provisioning and simple configuration changes. Optimizes efficiency by allocating disk storage space in a flexible manner among multiple users, based on the minimum space required by each user at any time. With thin provisioning, applications use only the space they are actually using, not the total space that is allocated to them. Enables easy and nondisruptive moves of volumes from another storage system onto the Storwize V3700 Storage System by using FC or SAS connectivity. Enables creation of copies of data for backup, parallel processing, testing, and development, and have the copies available almost immediately. Base software supports up to 64 FlashCopy targets per system. The Storwize V3700 storage capabilities can be expanded with optional licensed functions. Each optional Storwize V3700 function is licensed on a per-system basis and covers controller unit and all attached expansion units. To help evaluate the benefits of these new capabilities, licensed functions (with the exception of FlashCopy upgrade) can be enabled at no charge for a 90-day trial period. Trials are started from the Storwize management GUI and do not require any Lenovo intervention. Upon expiration of the trial, the function is automatically disabled unless a license key for that function was installed onto the machine. Turbo performance increases the maximum IOPS and throughput of a Storwize V3700 Storage System. Configurations with greater than 80 disk drives or more than five SSDs are ideal candidates to benefit from the increased IOPS offered with Turbo performance. Configurations with greater than 30 HDDs are suited to benefit from the throughput increase offered with Turbo performance. FlashCopy allows the creation of copies of data for backup, parallel processing, testing, and development, and have the copies available almost immediately. All Storwize V3700 storage systems support up to 64 targets per system at no charge. The FlashCopy upgrade option increases this support to 2,040 FlashCopy targets per system. Storage tiering helps optimize storage use with data location to improve system performance, reduce costs, and simplify management. Easy Tier automatically and dynamically moves frequently accessed data to flash (solid-state) drives in the system, which results in flash drive performance without manually creating and managing storage tier policies. Easy Tier makes it easy and economical to deploy flash drives in the environment. Metro Mirror maintains a fully synchronized copy at metropolitan distances (up to 300 km). Both functions support VMware Site Recovery Manager for disaster recovery. For ultimate flexibility, Storwize V3700 remote mirroring interoperates with any other Storwize family system, including Storwize V7000, Storwize V5000, and SAN Volume Controller. The remote mirroring option must be acquired (or licensed) for the primary (local) and secondary (remote) systems. If Storwize V3700 is mirrored to a system other than Storwize V3700, the other system must have the appropriate and applicable license for remote mirroring. The following table lists ordering information for optional software features. The Storwize V3700 AC-powered units ship standard with two 2.8 m, 10 A/100 - 250 V, C13 to IEC 320-C14 rack power cables. Optionally, country-specific line cords also can be ordered (see the following table; each part number or feature code contains two line cords that are needed per one unit). For DC-powered units, two DC power cables are included with the unit. The Storwize V3700 has a three-year Customer Replaceable Unit (CRU) and onsite warranty with 9x5/next business day (NBD) terms. Lenovo offers the service upgrades through warranty maintenance upgrades and post-warranty maintenance agreements with a well-defined scope of services, including service hours, response time, term of service, and service agreement terms and conditions. The warranty service definitions for the Storwize V3700 system are listed in the following table. On-site service A service technician arrives at the client’s location for equipment service. 24x7x2 hour A service technician is scheduled to arrive at the client’s location within two hours after remote problem determination is completed. Lenovo provides service around the clock, every day, including Lenovo holidays. 24x7x4 hour A service technician is scheduled to arrive at the client’s location within four hours after remote problem determination is completed. Lenovo provides service around the clock, every day, including Lenovo holidays. 9x5x4 hour A service technician is scheduled to arrive at the client’s location within four business hours after remote problem determination is completed. Lenovo provides service 8:00 am - 5:00 pm in the client's local time zone, Monday - Friday, excluding Lenovo holidays. For example, if a customer reports an incident at 3:00 pm on Friday, the technician will arrive by 10:00 am the following Monday. 9x5 next business day A service technician is scheduled to arrive at the client’s location on the business day after remote problem determination is completed. Lenovo provides service 8:00 am - 5:00 pm in the client's local time zone, Monday - Friday, excluding Lenovo holidays. Calls received after 4:00 pm local time require an extra business day for service dispatch. Next business day service is not guaranteed. Committed Repair Problems receive priority handling so that repairs are completed within the committed time of 6 or 24 hours. Lenovo provides service 24 hours/day, every day, including Lenovo holidays. Committed Repair Services enhances the level of Warranty Service Upgrade or Post Warranty/Maintenance Service offering associated with the selected systems. Offerings vary and are available in select countries. Lenovo’s Hard Drive Retention service is a multi-drive hard drive retention offering that ensures your data is always under your control, regardless of the number of hard drives that are installed in your Lenovo system. In the unlikely event of a hard drive failure, you retain possession of your hard drive while Lenovo replaces the failed drive part. Your data stays safely on your premises, in your hands. The Hard Drive Retention service can be purchased in convenient bundles with our warranty upgrades and extensions. Lenovo experts can seamlessly manage the physical installation of your server, storage, or networking hardware. Working at a time convenient for you (business hours or off shift), the technician will unpack and inspect the systems on your site, install options, mount in a rack cabinet, connect to power and network, check and update firmware to the latest levels, verify operation, and dispose of the packaging, allowing your team to focus on other priorities. Your new systems will be configured and ready for your software installation. Lenovo provides end-to-end storage compatibility testing to deliver interoperability throughout the network. The Storwize V3700 supports attachment to Lenovo System x®, ThinkServer®, and Flex System™ hosts by using SAS, iSCSI, FC, or FC over Ethernet (FCoE) storage connectivity protocols. Hybrid storage connectivity also is supported. The following table lists currently available SAS adapters for Lenovo servers that are compatible with the Storwize V3700 SAS storage (direct attach). The Storwize V3700 supports end-to-end 10 Gb FCoE connectivity with native FCoE ports or FCoE connectivity via FCoE/FC gateways with native FC ports. 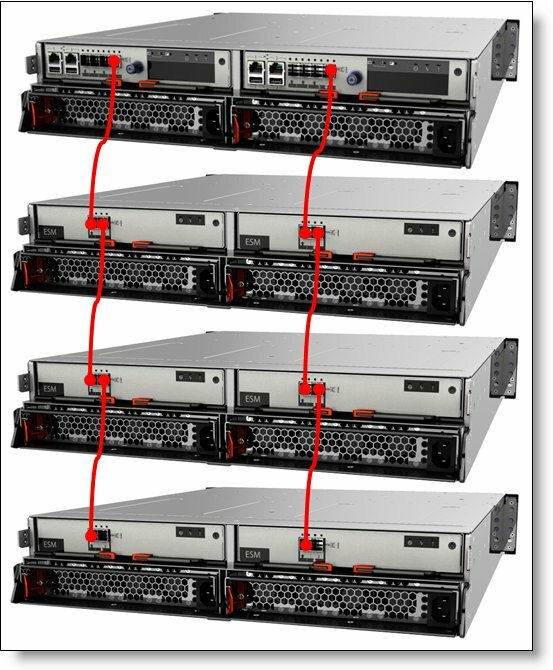 Lenovo RackSwitch™, Brocade, and Cisco converged switches can be used to provide FCoE connectivity with the Storwize V3700 FC storage. The Storwize V3700 also supports iSCSI attachments via standard 1 Gb or 10 Gb Ethernet network. Any compatible Ethernet switch, including Lenovo RackSwitch top of rack (TOR) switches and integrated BladeCenter or Flex System Ethernet I/O modules, can be used to provide iSCSI connectivity with the Storwize V3700 iSCSI storage. With software iSCSI initiators, any supported 1 Gb Ethernet or 10 Gb Ethernet adapter for Lenovo servers is compatible with the Storwize V3700 iSCSI storage. Currently available converged FCoE/iSCSI adapters for Lenovo servers that are compatible with Storwize V3700 are listed in the following table. Other HBAs also might be supported (see the SSIC for details). The Storwize V3700 supports direct FC attachments and FC switch-based attachments. Brocade and Cisco SAN switches can be used to provide FC connectivity with the Storwize V3700 FC storage. Currently available FC adapters for Lenovo servers that are compatible with the Storwize V3700 FC storage are listed in the following table. Other HBAs also might be supported (see the SSIC for details). The following table lists currently available Ethernet and FC rack-mount switches that are offered by Lenovo that can be used in Storwize V3700 storage solutions. The following table lists currently available Ethernet and FC embedded switches and pass-thru modules for Flex System that can be used in Storwize V3700 storage solutions. * Requires a supported Cisco Nexus top of rack switch. The following table lists the rack cabinets that are offered by Lenovo that can be used in Storwize V3700 storage solutions. The following table lists the power distribution units (PDUs) that are offered by Lenovo that can be used in Storwize V3700 storage solutions. The following table list the uninterruptible power supply (UPS) units that are offered by Lenovo that can be used in Storwize V3700 storage solutions. Hyper-V®, Internet Explorer®, Microsoft®, Windows Server®, and Windows® are trademarks of Microsoft Corporation in the United States, other countries, or both.